The Holiday Gift of Lashes! The holiday season is now quickly upon us. Ah, the season of giving. Eyelash Extensions! Extensions are a fantastic alternative and have gained tremendous popularity in the last few years because of their natural look, ease of application, and affordability. So what is the hype all about? First, understand the process as a consumer and then trust your eyes only to a certified and appropriately trained professional. The extensions themselves are perfectly polished polyester points. They come in a variety of thicknesses, colors and degrees of curl. Extensions are applied one lash at a time with care and precision using special bonding agents for a completely natural look. The result is thicker, longer eyelashes that are safe in the shower, while swimming, sleeping or exercising. suiting your facial features and lifestyle. While a full set is coveted for weddings, holiday parties and special occasions, a demi-set is great for everyday. Lasting Looks also offers a Wink set – great for teens! Your natural lash turns over every 60 to 90 days and a new extension is applied to keep your lavish look fresh. These one hour Refining Applications are recommended every 2 to 4 weeks. When comparative shopping, be sure to consider the amount of time dedicated and number of lashes applied when pricing initial sets and your refining applications. that they have been professionally trained by a reputable company and that they are using quality adhesives and lashes. Your technician should also have an artistic flair when applying your lashes. This isn’t a one-size-fits-all treatment. The right combination of length, thickness and curl is needed to achieve your custom look. Experience and attention to detail absolutely matter. – The Natural Blond, for dark, dramatic lashes. Lasting Looks has the professional, perfected technique, applied by a licensed, certified and experienced Eyelash Extension Specialist. Safe and affordable, trust your eyes to Lasting Looks! The Lasting Looks mission starts with the desire to empower women to take charge of their appearance and to put their best image forward. Opening in 2006 as a permanent cosmetic studio, Lasting Looks quickly saw the need for other time-saving and cost effective options. Eyelash Extensions and quality skincare were soon added. With great success, Lasting Looks has moved to the shops at Hockessin Corners and is a complete Day Spa offering spa facial treatments, chemical peels, Nufree face and body hair removal, lash and brow tinting, slimming detox body wraps and massage. 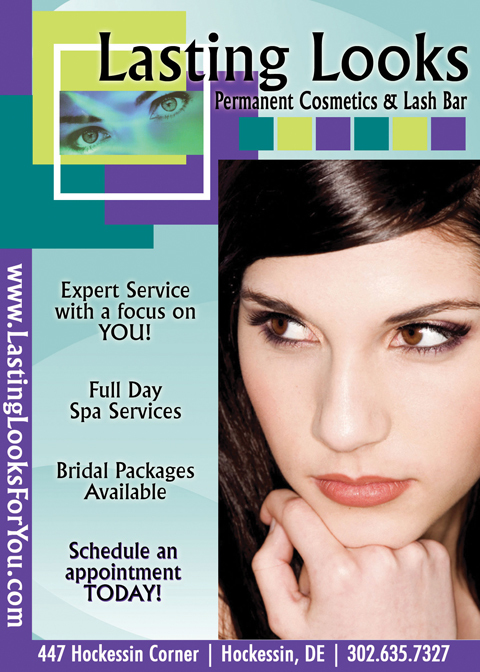 Visit our website for details and information on all our services: www.lastinglooksforyou.com. ← Previous Story The Thompson Team – The Team that Turns Your Dream to an Address!